Dark Sword Miniatures now has their 4-DVD pack for Masterworks Miniatures Painting featuring Marike Reimer available in their webstore. Learn from the pros how to paint your figs. 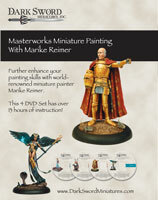 The brand new Masterworks Miniature Painting with Marike Reimer 4 DVD set (over 13 hours of actual instruction) is now available in our Online Store. It is here and ready for shipping out around the world. It is a great DVD set folks. The reactions at Gen Con Indy were very positive. If you ever wanted to know how Marike does what she does with painting miniatures, than this DVD set is for you. You will level up big time. You can swing on by the Dark Sword site and check out the new Masterworks Miniature Painting with Marike Reimer DVD page for more information and a link to the Youtube Trailer which does not even begin to do this DVD set proper justice (as the process of miniature painting is a deep dive, not a 30 second sound bite).